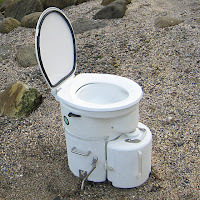 Why choose a composting toilet for your boat? I've recently decided to replace the toilet and holding tank system in my Hughes 29. This is the first of a series of posts that I am doing to outline my purchase decision, initial review (pre-installation), installation, short term review and finally a long term review. I will update this initial page with links to the other posts as I get to each step. I've also created an initial review of the [good] purchasing experience on my customer service blog here. My Hughes 29 has a standard, manual pump, Jabsco marine head. This attaches to a Y-valve that has the option of either pumping directly overboard or pumping into a ~10 gallon soft holding tank (bag). I don't like the idea of pumping overboard and I try to avoid it as much as possible. So that leaves only the storage tank. I have had my sailboat for 3 years now. Since the first weekend on the boat I have had issues with the head smelling. I have tried tightening fittings, adding additives to the holding tank and frequent pump-outs but I still have a lingering smell problem. Sometimes it is tolerable, other times not. My first reaction was to simply start from scratch and put in a new toilet and holding tank. I removed all of the pieces of the system last fall with that intention. I didn't want to start with any of the old components because I didn't want to risk a remaining piece being part of the problem. Then a few months ago I stumbled on the [seemingly] magic of the composting toilet. According to all of the posts that I can find and the vendor documentation, these things are supposed to be odorless when they are installed and used properly. This was my #1 requirement. Apparently it is the separation of solids and liquids, along with the venting system that allow this. The leading vendors claim, and posts online seem to re-enforce the fact that you only need to empty the solids bin once or twice in a summer season (every 3 months for a live-aboard). Liquids are separated and need to be emptied every couple of days. I can live with carrying a bottle of pee onshore every couple of days. I really like the idea of reclaiming all of the space that my current holding tank takes under the front v-berth. The toilet itself is only 1 1/2" larger in each direction than my current Jabsco toilet. Compared to changing out all of my current piping, installing a new tank, venting, and a manual overboard pump-out solution (a requirement in my view); installing the composting toilet will be a breeze! Simply bolt it down. While I am very conscious of the environment, this isn't a huge factor in the decision for me. I don't believe that my boat (and small amount of discharge) is any more than a drop in the bucket compared to the local municipalities that dump [mostly untreated] waste into the same river system and harbour. But, it is a nice-to-have. The vendors claim that their composting toilets are cheaper to install than a traditional system. I don't really believe that. The full cost of the composting toilet is around $1000-$1200 (after taxes and shipping). I can install a new version of what I have for around half that cost. Anything that can save maintenance time on the boat is worth its weight in gold. I don't mind doing maintenance but that isn't why I have the thing. Less is better. These vendors appear to have similar products and each has good reviews in the Internet forums. I chose Airhead because of the resoundingly good customer service stories that I heard. That is important to me. Stay tuned for my future posts about my Airhead. Time will tell whether this decision was as good as it seems.